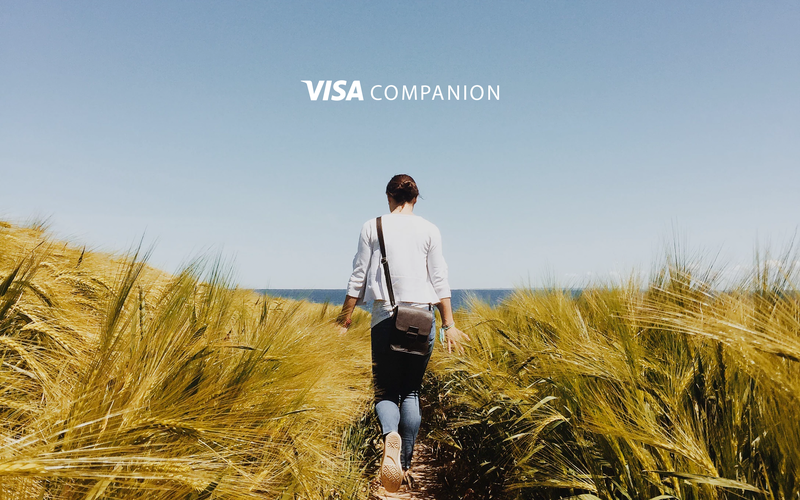 Visa Companion was a consumer-focused mobile and web app created to help address the gap of digital product offerings of issuers to their customers. In the years leading up to my arrival, Visa's primary focus was to process payments and support their larger issuing partners (Bank of America, Chase, Citibank, Wells Fargo, etc.) by licensing proprietary technology for their digital services. In light of a radical shift of Visa's digital go-to-market digital product strategy, the executive team realized that the more significant portion of their issuing banks (credit unions and other small/local banks) were drastically falling being in their technology offering. It was then up to the design team to develop a digital strategy to help address the offering gap. The group began by interviewing stakeholders in addition to Issuers and their customers. Once we had a better understanding of the digital product offering landscape, we worked with internal research teams to exercises various methods to get further validation for some of our initial ideas. Our research methods included everything from multiple types of quantitative and qualitative testing to in-lab card sorting exercises. The Issuer has already created a solution. Whether by building the product offering with an in-house team, licensing the technology from Visa, or a combination of both. The Issuer has a digital product that provides some functionality for their customers. Their product offering could include balance monitoring, transaction history, money transfers, bill pay, deposits, and other essential features. The Issuer has little to no digital product offering and primarily relies on paper and mail to communicated account changes to their customers. The first option was already well established amongst Visa's current Issuers but had no product offering for the latter categories. So the design team decided to pursue building two products. This first proposed solution was a white-labeled app that gives smaller Issuers the opportunity to input their branding in addition to having feature parody with their larger competitors. The other was a Visa-branded product that provided specific features that some Issuers were not able to offer. The product offering within this app would also be deemed to be a fundamental offering that Visa required all Issuers provide to their cardholders. 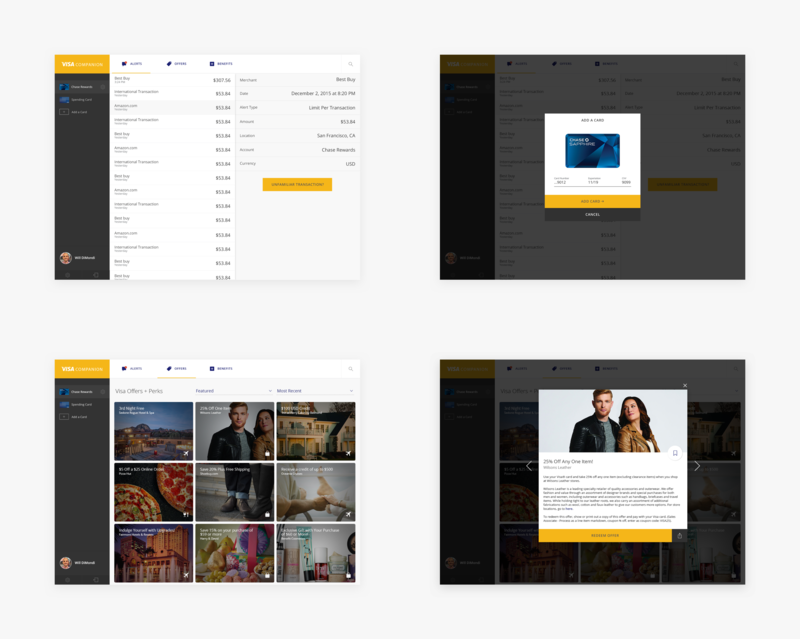 With one team focused on the white-labeled solution, I was tasked with leading the design and engineering efforts of building the Visa-branded solution. The offering consisted of a web and mobile (iOS & Android) app that would need to encompass the primary features of transaction alerts, Visa card-linked offers and benefits, and an ATM locator. We were also tasked with building a foundation that was able to encompass additional features as the product offering grew in the future. Above: an early iteration of the onboarding experience. 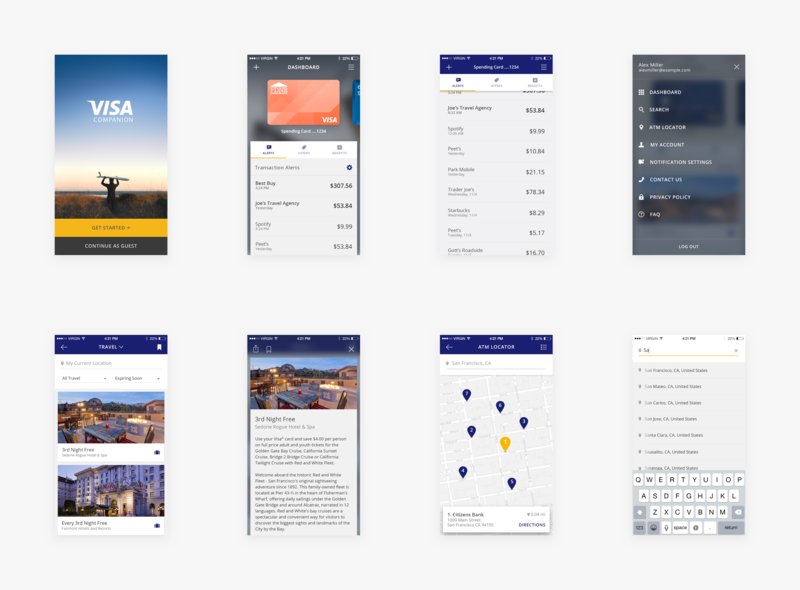 Aside from providing the essential requirements, the team wanted to create an intuitive experience that steered away from feeling like the typical utilitarian banking app. Before we started execution, we set a number of core values to build towards. These were authenticity, autonomy, and authorship. We also aspired to use this opportunity to help convey the Visa brand in a different light. Because Visa had always remained in the background (outside of physical cards), this would be one of the first Visa-branded digital products released to the public. That said we also aspired to ensure that product offering had a focus on access, fulfillment, recognition, badge value, and momentum. Visa is an extremely trusted brand in the eyes of consumers, so decided to use that to our advantage in addition to, of course, upholding that image. One way we decided to pursue our established core values and product offering were to create an onboarding experience that would convey the app in everyday experiences (in the video above). The focus of the mobile app's core experience was enabling cardholders to effortlessly manage their transaction alerts in addition to providing an easy way to browse the offers and benefits that come with every card. While this portion of the project was considered the guinea pig of the newly found mobile strategy, my team worked alongside the folks creating the white-label experience to ensure we were building cohesive functionalities between both products. Above: load in animation for the desktop login experience. Because the team decided to pursue a mobile-first approach, the desktop app was mostly a feature parody minus the initial onboarding experience. We made this decision based on our research findings that majority of participants claimed they saw themselves utilizing a service like this on their mobile phones rather than their desktop computers. Therefore, we had anticipated that there would be less traffic and utilization in comparison to the mobile app. Nonetheless, we wanted to provide cardholders with the ability to access the same functionalities on their desktop computers.